Home Board / Organizations TSCHE TS ECET 2019 Application Form – Released! 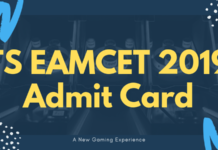 TS ECET 2019 Application Form – Released! TS ECET Application Form 2019 – Jawaharlal Nehru Technological University, Hyderabad, has released the application form of TS ECET 2019 over ecet.tsche.ac.in. TS ECET 2019 will be held on May 11, 2019, for Diploma Holders of Engineering/Technology/Pharmacy and for B.Sc. (Mathematics) Degree Holders and in short as TS ECET [FDH & B.Sc.(Mathematics)]-2019. Candidates can fill the TS ECET 2019 Application Form in the online mode only. Candidates can check the process to submit the TS ECET Application Form 2019, fee details, the process to remit fee, important requirements and more details from this article. Latest: Last date for submission of Online application form for TS ECET 2019 has been extended to April 15, 2019. Scroll down to fill the same. It is to be noted that candidates can edit the already submitted TS ECET 2019 Application Form until a prescribed period of time. Also, candidates can submit TS ECET 2019 Application Form with late fee too after the lapse of the deadline. For more information about TS ECET Application Form 2019, candidates can go through this article. Apply Online: Click here to apply online for TS ECET 2019. Mode of Payment: The Registration fee has to be paid at TSOnline Centers in T.S., APOnline Centers in A.P or through online using Credit card /Debit card /Net Banking. Before filling the TS ECET 2019 Online Application Form, keep the following mandatory details and documents ready beforehand to fill in the appropriate fields. Examination Center to which candidate wishes to appear TS ECET-2019 exam. Community (SC/ST/BC/ Others), Minority Status (Non-Minority/Minority). To fill the application form, the candidates first of all need to click on the link given above. It will redirect to the registration portal where the candidates will have to submit all details. Enter all the details including the mandatory details in respective fields and click on the “Preview/Submit” button. Modify: Click on Modify button to modify the filled in details in the ONLINE application form. Confirm/Freeze: Click on Confirm/Freeze button to confirm the application. By clicking on Confirm/Freeze button, a candidate can view pop up alert as “Your Application confirmed successfully. Please note your Registration Number for further Correspondence”. Candidate can take printout application by clicking on the Print Application button which is useful for further correspondence. After remitting the amount of fee, the TS ECET Application Form 2019 will be displayed. The candidate may take a print out the filled application form by clicking on “Print Your Filled In Application Form”. In order to print the application form candidate will have to enter their registration number, payment reference id, qualifying examination hall ticket number, mobile number, and date of birth. 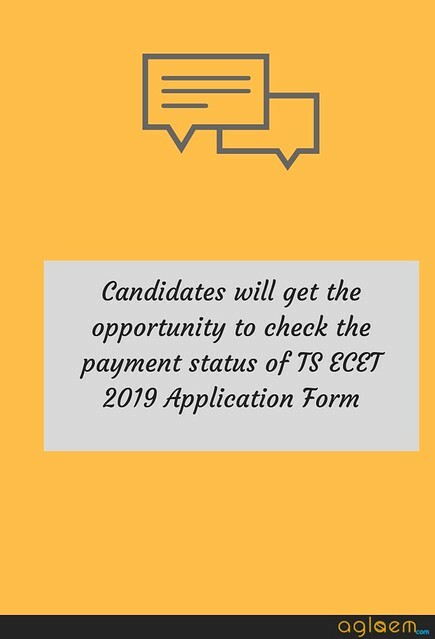 It might be possible that candidates will get TS ECET 2019 Application Fee Status after submitting the TS ECET 2019 Application Form. Candidates can have a look at their payment status by logging in with their login credentials such as their Qualifying Exam Hall Ticket Number and Mobile Number. Q. Can I submit the application form of TS ECET 2019 offline? A. No, the provision to submit the application form is not available. Q. I do not possess an Aadhaar Card, can I use any other ID card to apply? Q. The deadline to submit the TS ECET application form is over but I have remitted the application fee. Is there any medium to apply?. A. Yes, the application form of TS ECET 2019 can be submitted after the lapse of the deadline by paying the late fee fine. 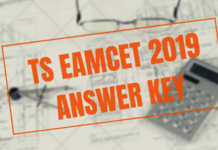 Q. I possess a graduation degree, can I apply for TS ECET 2019? A. No, only Diploma holders and candidates possessing B.Sc. degree in Mathematics can apply.